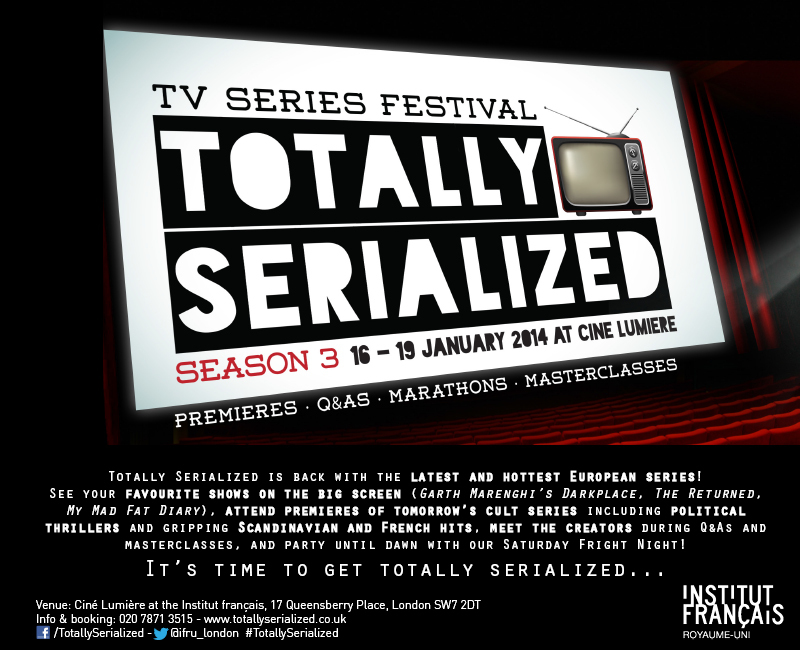 From 16 to 19 January 2014, Ciné Lumière will hold the third edition of Totally Serialized, London’s favourite TV series festival. It will showcase the best of new productions from both sides of the Channel as well as European TV series. Audiences can enjoy their favourite shows on the big screen (Garth Marenghi’s Darkplace, The Returned, My Mad Fat Diary) attend premières of tomorrow’s cult series and meet the creators during Q&As and masterclasses. 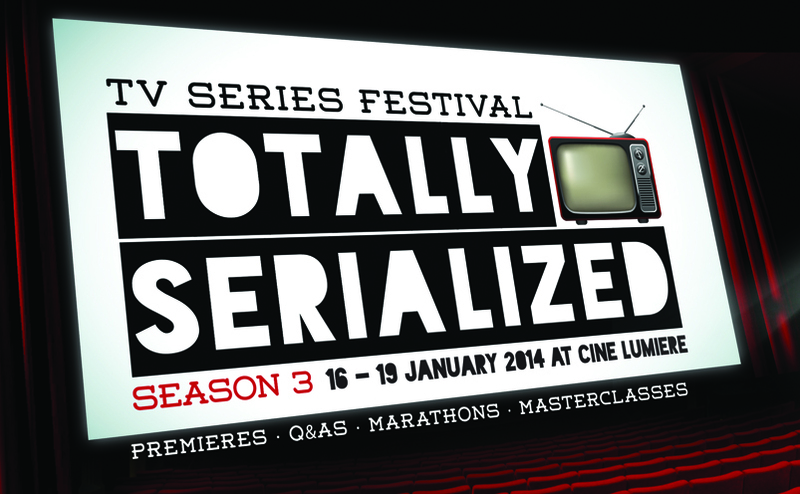 Totally Serialized is back for it’s third year and this time I’ve got some tickets to give away. Three pairs, to be precise. The Cult Comedy Marathon will feature episodes of French shows Love Bugs (Un gars, une fille) and So (Bref), as well as favourites from the UK. Followed by a Q&A with director Pierre Schoeller and James Rampton, arts feature writer at The Independent. Maybe you’ve been to this the last few years and fancy going again for free? Maybe this isn’t something you’d normally consider but are willing to try something different? Or perhaps you just live nearby and are just looking for something to do? Whatever the reason, if you want to win tickets then simply tell me how depraved your excesses were whilst watching TV on Christmas Day. Did you eat a whole roast goose stuffed with Quality Street and smothered with pan-fried otters’ bile for breakfast before preparing your main meal? Or perhaps you marinated your own liver with five litres of Baileys, in situ, coughed it up and ate it with lashings of piccalilli before visiting the hospital and lightly dying? Maybe you had half of that second dry cracker, which is more than enough for any God-fearing human? 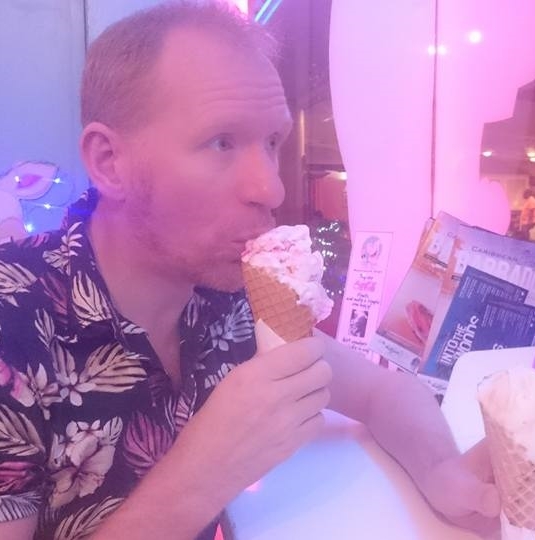 Invent your tales of excess, leave them in the comments below (or email them, if you must – why do most of you email your comments these days? Are you ashamed to be seen with me? Don’t blame you, I am) and don’t forget to say which of the three pairs of tickets you’d prefer. Maybe leaving the comment with a valid email address might help too? 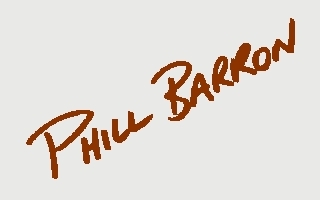 The closing date for this will be … I don’t know. New Year’s Day 2014? That sound good? The rise of TV shows in the past few years has been meteoric, with clunky acting, minimal plotlines and pre-recorded laughter replaced by multimillion-dollar productions starring A-list actors, with staggering special effects, and the finest writers churning out complex stories and incisive dialogue designed to keep the viewer hooked. An even more recent development in the British TV industry has been the breaking down of frontiers, with international buyers moving away from a remake-centred strategy and now broadcasting the original series with subtitles. French shows such as The Returned, Braquo, Spiral, Hard and Maison Close have benefited from this shift, and have proven to be a success on Channel 4, FX, BBC Four and Sky Arts respectively. One of the aims of this festival is to encourage this trend by showcasing tomorrow’s cult series. TV professionals will get a chance to participate in an industry event dealing with various aspects of the constantly-evolving field of TV series, including producing, screenwriting, and financing, as well as case study of The Tunnel featuring writer Ben Richards amongst others. There will also be networking opportunities to allow ideas and future collaborations to flourish. The general public can also have a peek at what goes on behind the scenes with our Craft Masterclass on women and TV writing, organised in collaboration with BAFTA, during which leading screenwriters such as Virginie Brac (Spiral), Paula Milne (The Politician’s Husband, White Heat, Small Island) and Emma Reeves (The Dumping Ground, Young Dracula) will examine women’s contributions to screenwriting and the particular obstacles they face. This masterclass will be a central part of our Leading Ladies strand, which will also include UK premieres of the French hit Mafiosa in the presence of director Pierre Leccia, and of season 2 of My Mad Fat Diary, in the presence of Sharon Rooney and writer Tom Bidwell. Our other highlight will be on political thrillers, with three gripping UK premières on Sunday 19 January: the Belgian Salamander, recently acquired by BBC Four for its Saturday Night Slot; the Danish hit The Protectors, an Emmy Award-winning offering of Nordic noir which is set to delight fans of Borgen and The Killing; and the French Les Anonymes by Pierre Schoeller (The Minister), who will be here for a Q&A. Following the success of our UK premiere of The Returned in last year’s edition of Totally Serialized, we are pleased to host a marathon of the full first season of the now Emmy-awarded French show as part of our Saturday Fright Night, which will also feature a 10th anniversary screening of all the episodes of Garth Marenghi’s Darkplace – with a Q&A with Matthew Holness – and a zombie party. For those who prefer laughter to chills, our Cult Comedy Marathon will showcase the best comedies from both sides of the Channel.